Mixer With Heating Jacket Description: SE-Test India Pvt. Ltd., are the most dependable and consistent manufacturers and suppliers who are providing high-quality lab testing instruments. SE-Test India’s test apparatus Mixer with Heating Jacket (Model No. 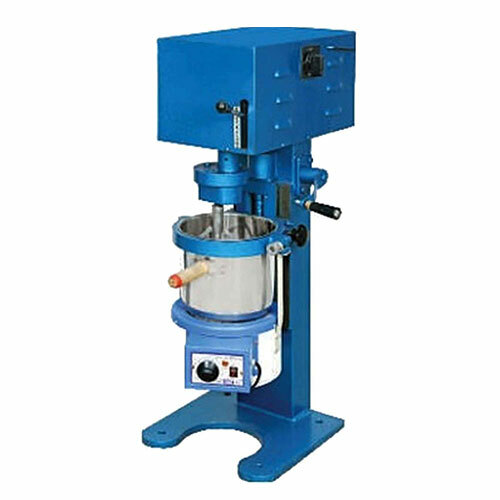 1311) is used for making various types of asphalt test specimens. This instrument is motorized carrying two speeds i.e. planetary or revolving. It comes with 6 ltr. Capacity mixing bowl for mixing the specimens fitted with Heating Jacket for heating the samples at the bottom of the bowl. The mixing bowl can easily be held and removed with the instruments and its height is also adjustable. It is the most cost-effective and efficient apparatus used in electronics, civil, and industrial segment. SE-Test India Pvt. Ltd. Mixer with Heating Jacket is manufactured with the upgraded raw material of only premium quality, which gives this apparatus an edge above other. SE-Test India’s customers are around the globe and to whom we are exporting the supreme and premium quality test instruments. Our test instruments or equipments are manufactured with the upgraded raw material of only premium quality, which results in the best product as an outcome. A 6-litre capacity mixer Used in conjunction with an Iso Mantle Electric Heater for use of Bench Mounting mixer. Suitable for mixing samples of asphalt. Provided with a bowl, beater, and a whisker. Comes with 6 liter nominal bowl capacity. Voltage: 230 V A.C. with a single phase.